Summers in Chicago are a gift from the gods. September is the peak month of the season. Temperate weather is ensured by Lake Michigan at its warmest. The days are easy and the nights dreamlike. 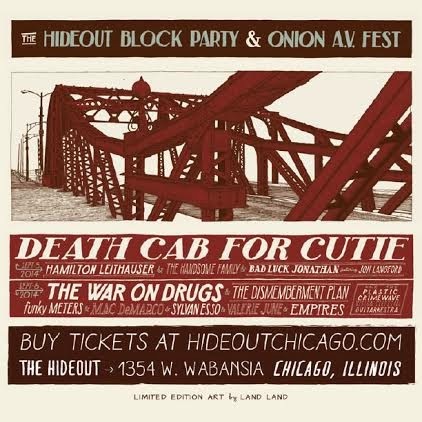 A jewel on September's crown is the Hideout Block Party: Two Chicago stalwarts, The Hideout and the Onion's A.V. Club, are hosting the block party outside the Hideout for the third straight year. As always the fest will be family friendly and party ready. You can buy tickets at Block Party Tix. Don't let the handling fee throw a curve at you. A good chunk of it will be going to local charities rather then enriching Ticketmaster. NOLA's Funky Meters, alone, are worth the price of admission. Every other band will be icing on the cake... and a tasty cake it will be. Music fans should not limit their visits to The Hideout to one time a year. The club is one of my favorite venues for one beer or a dose of good music. Checkout the calendar, and put it them on your rotation.